Where has the winter gone? I am really happy to see the unfurling leaves, hear the birds sing, and the last two days have been pure boating joy with the sun really making its presence known, but (only a little but)… just one more month of preparation time wouldn’t have gone amiss! I’m all caught up now though, and another Spring and Summer season of travelling and trading is underway for TheArtBoat 2018. The first floating market of the year at Market Haywood was a great start to the season, and the lovely people who came to see and support the floating traders were not deterred by the rain and copious amounts of mud. 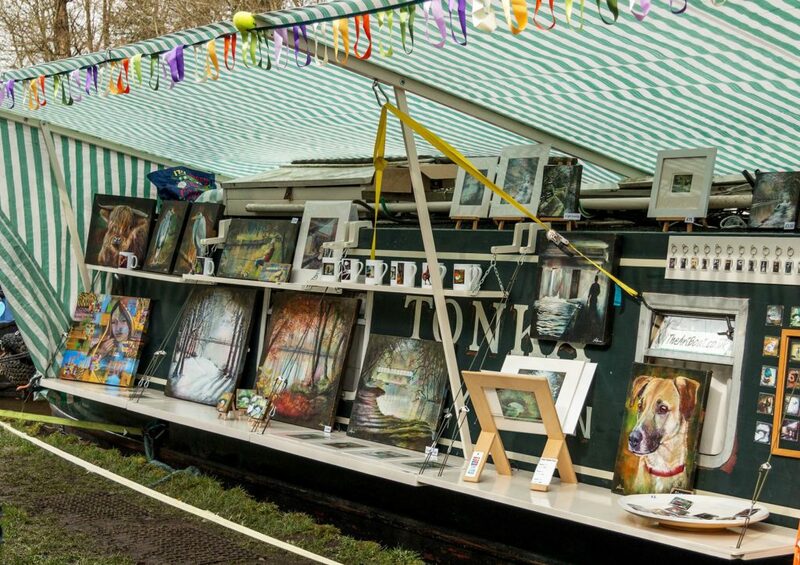 The Art Boat is presently on its way to the RCTA Floating Market at Berkhamsted, with a couple of stops for a “PopUp” art gallery on route. This is the schedule so far, (Please note that any PopUps are dependant upon available space and weather). Although the Art Boat hasn’t travelled very far over the past couple of weeks, lots of business has been going on inside and I have two new paintings that are travelling with me. They will be displayed for the first time at Stoke Bruerne this weekend. Looking forward to catching up with you somewhere on the cut. Making Plans for The Art Tour. Getting ready to leave on the Art Boat seemed to take for ever, so I can’t believe that we are already 4 weeks into the Art Tour. This is the art boat’s first year of having to work out it’s own itinerary . 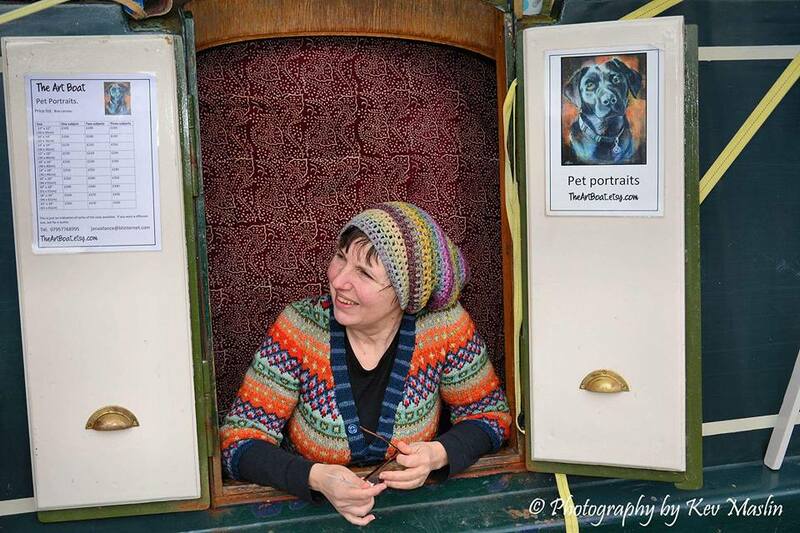 Last year we were totally spoilt by being part of the artists on the canal tour organised by Magda and Berth on Wanderlust. Although it has taken a while to work out a do-able tour (Some of the festivals I wanted to do would have involved The Art Boat growing wings in order to get there in time!) it has been fun trying to decide where to go. Some festivals I would have liked to attend were booked up before we got chance, and others just fell into our laps. Now is the best bit…actually doing it. So Far I have managed to experience a lovely family funday at Buxworth, a solo pop-up, and two pop ups with other traders, the first time with a Pirate (…Aaar) and a HomeBrew Boat (…aar..hic!…aaar), and the second time with The Oat Cake Boat and Flavours afloat (yummmmm). I have managed to put my brand new shelter up and take it down on my own. (easy peasy), and had the heavens kindly provide the usual variety of April weather in order to help test the shelter. And, I am pleased to say Barry, it is holding up magnificently. On land I have had work hanging in Audlem Mill as part of the Guild of Waterways Artists exhibition. The draw to mark my new website and online shop took place on 1st of April. I was really pleased with the amount of people that subscribed to The Art Boat blog and entered. 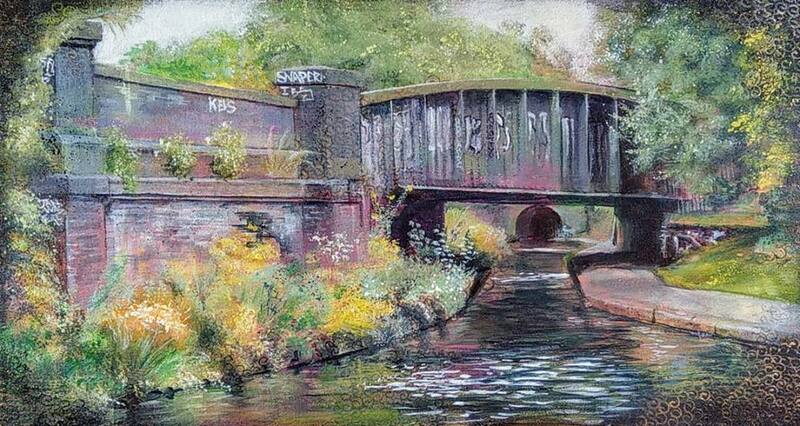 Tony Binns was the winner, and chose a hand finished print of View through a Bridge as his prize. You can see the video of the draw HERE. I have just sent out emails with the discount coupons to those that subscribed in March , so if that’s you, keep an eye on your inbox. I am hoping to see quite a few of you soon. We are covering quite a few miles this year, so it figures that at some point we won’t be too far away. You have no excuse, come and say hello! An exciting schedule planned this year for The Art Boats Floating Gallery/Shop. 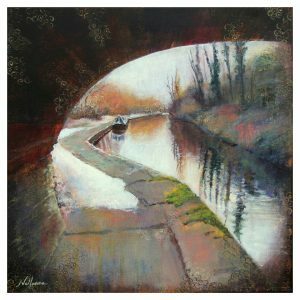 Quite a few festivals and RCTA Markets included as well as two exhibitions with the Guild Of Waterways Artists. 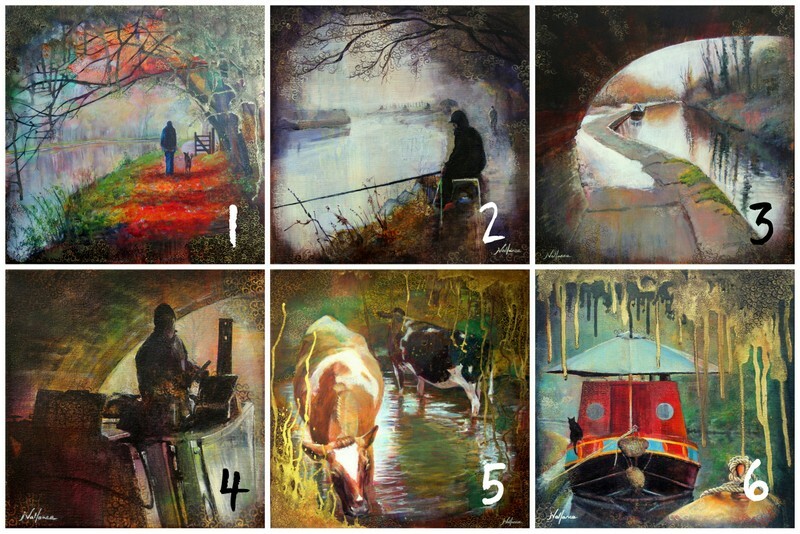 Audlem mill Easter exhibition (which you still have time to visit as it is on until the 9th April) and I will also be joining the rest of the Guild in the tent at Braunston in June. Pop-ups will be added to the schedule as I go along. I have added the ones for April. I have already had a fabulous start to the tour with Buxworth Gala. Despite the weather a great weekend was had, proving that us Northerners won’t be put off by a bit of rain…though come to think of it there were a few Southerners there too!  Saturday March 26 – Sunday March 27 Buxworth Community Gala.  Friday 29th April – Monday 2nd May Alvecote Floating Market.  Saturday 21st May – Sunday 22nd May Rickmansworth Canal Festival. 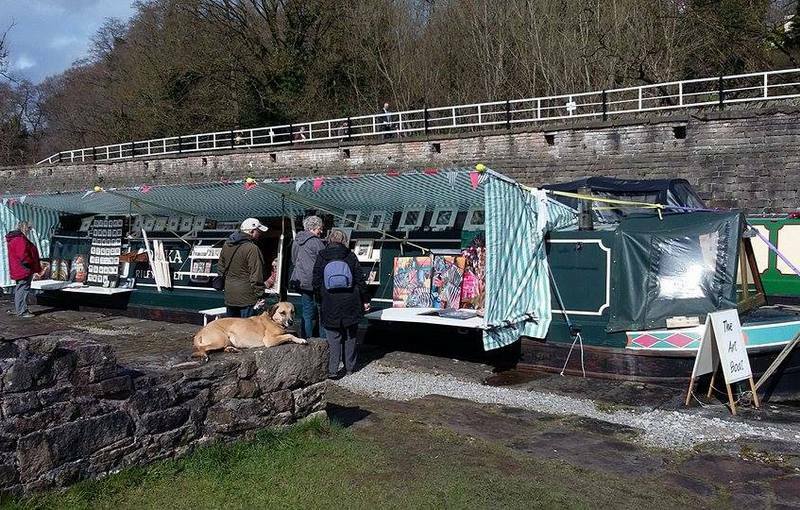  Friday 10th June – Sunday 12th June RCTA Floating Market, Gt Haywood. It’s that time again! Another chance to win one of my Hand finished Prints. I marked the end of the Artists on The Canals tour last year with a prize draw for one of my Hand finished Prints and the response was excellent. This time I am marking the beginning of The Art Boat tour 2016. The last competition was run from my facebook page, but this time I want to show off my brand new website and blog, so the prize draw will be run from here. What is a Hand finished Print? 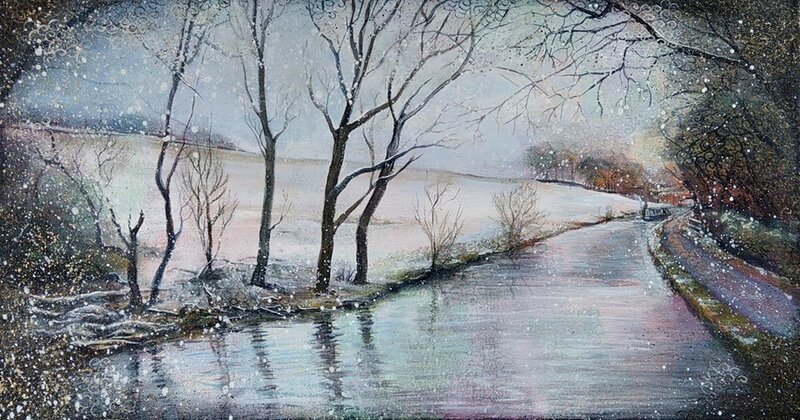 The prints are all taken from images of Jan Vallance original paintings. How do I enter the prize draw? Subscribe to my blog during March and you will automatically be entered. Don’t forget to…. How and When will the winner be announced? The competition will close at midnight on March 31st, and the winner will be announced on Friday April 1st. I am hoping to be able to video the draw again as that was very popular last time.